I was working in downtown Cincinnati at the Cigna offices on Seventh Street when my boss received a call from his dad in the New York office letting him know a plane had hit one of the World Trade Center towers. He shared this information with us and we all imagined it was a small plane and that the pilot had somehow lost control. It was a splendid September morning in Cincinnati, just like it was in New York City: warm, sunny, clear blue skies. The weather was perfect. Soon that blue NYC sky would turn to dark gray then black. I made my way back to my desk and called my sister Karen, who I knew would be home. She was working on her dissertation. I told her to turn on the television. As we were talking, she gasped and said, “Oh, my God. One of the towers just fell.” Shortly afterwards, we were all sent home. Even away from the chaos and fear, we felt it and didn’t know if we too might be next on the target list. I made it home just before Tower 1 crumbled, as if it were a sheet of ash and smoke cascading to the street. I spent the next few days glued to the television. Somehow I felt that if I paid attention, sat vigil with the emergency workers, medical personnel, the people searching for loved ones, and New Yorkers trying to cope with the devastation to their city, that somehow I was offering them support, love, and strength. My sister nagged me to turn off the TV because my nonstop mourning was becoming unhealthy. I thought that with the number of people affected by this tragedy that most Americans probably would know someone who worked in the World Trade Center or knew someone who did. Well, ended up I did know someone. Two people, actually: one who got out, another who did not. Her name was Stacey Peak. She graduated high school a year ahead of me. She was 36. Stacey was from my hometown in southern Indiana had been living in New York City for about two years, working at Cantor Fitzgerald as a gas/power stock broker. I heard the news from my mother. She told me that Stacey’s mother had received a call from her that morning. She was on the 105th floor of the north tower when she made the call. Newspaper reports later revealed that her mother said Stacey was hysterical when she called, telling her that she was trapped and didn’t know if she’d be able to get out. She told her mother she loved her and then had to hang up. I am forever haunted by that detail, wondering what those last moments of her life must have been like, the horror of rising flames and intensifying heat, knowing you were about to die. I know that is morbid, but it’s what I can never stop thinking about when I see photos of her lovely face and hear stories from friends and family. I also think of the helplessness her mother must have felt, not being able to protect her, save her. The anguish must have been intolerable and suffocating, as she waited for news of her daughter, holding out hope that somehow she escaped the carnage. I did not know Stacey except casually, but the hometown connection, and discovering that she was single, never married, living life on her terms, taking acting classes, all of it somehow connected me to her. Sadly, her remains were never found. There is a memorial to her erected in our hometown, Tell City, Indiana, in Sunset Park by the Ohio River. Every year on September 11, the Perry County News highlights a story about her and local news stations in Evansville remember people from the area who perished that day as well. Healing definitely takes time and the scars from that fateful day remain, the images and stories etched in our collective memory—for those of us who lived through it anyway. So as I do every year on this date, I will take a moment to remember Stacey, send a smile and a blessing heavenwards, say a prayer for her family and friends, and recommit to doing my best to try to make this world a better, more peaceful place. As I have shared in this space before, I love a good conspiracy theory. A worthwhile conspiracy theory needs to start from a kernel of truth, or at least potential truth. Once that kernel exists, the best possible breeding ground is a lack of verifiable information. A few holes in an official story. Maybe some redacted documents. If all those things are in place and the event in question happens to be one of the biggest stories of a brand-new century, well, you’ve got yourself one heck of a greenhouse for conspiracy theories. Unfortunately 9/11 meets all of those requirements. Which is why there are theories refuting every single aspect of the official version of what happened that day and the days before and after. Some of them are fanciful, some bigoted, some outright disgusting. Another thing about conspiracy theories, though, is that sometimes they have more than a kernel of truth, and sometimes people who are supposed to be able to tell you that something is just a silly theory have been kept in the dark just like you have. You may remember that former Senator (and all-around good government straight-shooter) Bob Graham co-chaired a 2003 Congressional joint committee into the events surrounding 9/11. You would think that if anyone would be able to shut down foolish questions about 9/11 it would be Senator Graham. But he has some of the same questions “conspiracy theorists” have. And Bob Graham is nobody’s tinfoil-hatter. He just can’t get the FBI to tell him the truth. Any truth. Senator Graham has asked enough inconvenient questions to get himself detained at Dulles airport by the Bureau. There are almost certainly untruths we have been officially presented regarding 9/11. Those lies – let’s call them what they are, shall we? – might be for reasons as anodyne as not wanting to embarrass important people. They might be far more sinister. We don’t know. Bob Graham doesn’t know. That’s a problem, and it’s one that won’t conveniently go away. As a nation we will never be able to put even the wildest of the conspiracy theories surrounding 9/11 in the ground until we – or at least our most trusted representatives – can get straight, unredacted answers instead of ridicule and intimidation. I want to see those conspiracy theories settled. I want them buried in unmarked graves and forgotten. But until our leaders are willing to be honest with We The People about one of the greatest national traumas in decades, we will live with this fetid breeding ground of dark fantasy. In part 1, I shared my encounter with a crooked cop in 1999. He cited me for reckless driving, which was a completely bogus charge. He was in the wrong, and he knew it, which is why he failed to show up in court a month later. I was exonerated, but since that injustice against me I’ve been wary of police personnel and their intentions. I dared to challenge him, question him, at times my voice dripping with sarcasm. There was no witness to this abuse of police power, nor did I have a camera to videotape the incident, as is often the case these days when evidence of police brutality is captured and shared on social and news media sites. It is important to note that I walked away from this heated exchange physically unharmed. Many of our fellow Americans cannot say the same. The Black Lives Matter Movement has increased awareness about the number of African Americans killed—often unarmed—by police and imprisoned for even minor infractions. Whether you agree with Black Lives Matter’s ideas or tactics, to dismiss what it is they are trying to accomplish and communicate means racial tensions and misunderstandings will continue during law enforcement interventions and that needed adjustments to policies that will eradicate institutional racism will never happen. It behooves white people to listen to what they are saying, regardless of how uncomfortable it makes us, and even more important, to listen without getting defensive. 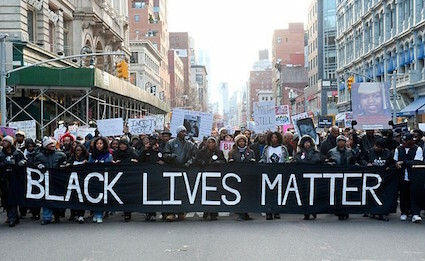 “To be clear, the Black Lives Matter Movement is not an anti-cop movement. It is a movement that vigorously and voraciously opposes the overpolicing of Black communities and the state-sanctioned killing of unarmed Black people (and yes, all people) by the police. It is a movement that insists on holding police accountable for their violence and that will hold police to a higher standard precisely because the state gives police the right to use lethal force. With more power comes more responsibility. Law enforcement officers deserve our respect, but respect goes both ways. One can simultaneously support policemen yet still want them to be held accountable for gross negligence or outright murder. The two ideas are not mutually exclusive, but that seems to be what is reflected on today’s social media sites: If you support Black Lives Matter, you must hate all police. If you support the police, you hate African Americans. It’s not that simple. I guess he didn’t like being challenged by a woman, so he pulled me over, saying I had caused him to veer into the oncoming lane, that I was driving recklessly, when in reality it was he who was doing so. He didn’t have his lights or siren on either, otherwise, of course, I would’ve pulled over. He stood at my driver’s window explaining this. I challenged him by asking, “Aren’t police officers held to the same traffic laws as the rest of us?” In the meantime his crony cop buddy had walked to the passenger side of my car, gawking in the window at me. Talk about an intimidating and scary situation: a small woman late at night alone with two male cops. I was scared, but I’m an actor, so I played the bravado for all it was worth. In my mind, these guys were the kind of policemen who would plant drugs in someone’s car or orchestrate something incriminating just to make an arrest. I drove away, trembling and tears welling up in my eyes. My tough exterior crumbled as I seethed at the injustice of it. I ended up writing the Covington chief of police and carbon copied the Kentucky state attorney general as well as Covington’s judge-executive and three county commissioners. I was willing to pay the fine and court costs if needed because I was not going to just pay the fine and was determined to have my day in court to refute it. I showed up in court a month later, but that cowardly cop was nowhere to be seen. I was exonerated and didn’t have to pay one cent. This encounter and the fact that the chief of police in Covington never responded to my letter spawned resentment toward policemen. Even to this day I’m a bit distrustful. I would be remiss if I failed to admit that I have also been granted leniency by cops on occasion, either because I am a woman or they knew my father, who was employed by the Indiana department of corrections. It is because of experiencing the extremes of police encounters that I view the current narrative saturating the media that states you either “love or hate the police, affording no middle ground” as a gross over-simplification of the dynamics of equal justice and policing at play in our society. This issue is too vast to possibly address all the intricacies in a blog post. The majority of policemen in this country are decent people who do a good job. They take pride in their work and want to protect and serve. It is a tough occupation and oftentimes a thankless one. They sometimes endure vitriol from citizens, encounter criminals, and face the possibility of being injured or killed in the line of duty, which is frightening, I’ve no doubt. However, police possess much power and they are armed—at times heavily. They are granted a good deal of leniency with regards to the law that backs them up, even when sometimes what they have done is lawless. There are bad apples in the system and accountability is important when an arrest or traffic stop goes terribly wrong. That’s not to say we shouldn’t mourn the killings of police officers either. Of course, we should, even those in the Black Lives Matter movement don’t want to see cops killed, despite what some in the media are claiming. We can do better. We must. Part two will focus on over-policing, the Black Lives Matter movement and why they should not be dismissed or demonized, and the contrast between my police encounter to that of Sandra Bland. The above statement is from an article on TheHill.com last Thursday. These numbers are understandable, even predictable, given that the vast majority of Americans fail to comprehend much of the framework of the deal and are being inundated by political pundits and media talking heads with scary sound bites and foreboding ads produced by opponents and special interests against it. I don’t pretend to fully understand it either. It is complicated. However, I have taken considerable time to delve into the issue by reading articles for and against it in Foreign Affairs, Foreign Policy, and other nonpartisan publications. I have come to the conclusion that Congress must support this deal. China, Russia, France, the United Kindgom, and Germany also agree – they worked with us on these negotiations. Should Congress find enough votes to override a presidential veto, the deal is technically broken. The countries working with us will also abandon the deal and we’ll be right back at the status quo where there are no inspections, the possibility of a nuclear Iran, and military force as the only alternative to imposing our demands on a sovereign nation. These negotiations have taken two years. The deal was hardly thrown together quickly and haphazardly. Yet opponents were lambasting it before they even read it, before it was even released. These are the same, or mostly the same, people who couldn’t get our military into Iraq fast enough. We all know that was an enormous mistake. Now, they once again seem to be intent on seeking a military-only option, which is just wrong-headed. God forbid we actually try to talk to people with whom we have disagreements. Furthermore, there is so much misinformation swirling about. I’ll briefly address two bits of misinformation that have arisen recently. Iran is given 24 days before outside inspections begin. This is inaccurate. The 24-day inspection rule is explained in detail by Max Fisher of vox.com. He also provides an outline of the inspection process. Summing up, “If inspectors try to get access to sites but at every turn are delayed by Iranian stall tactics, guess what: It will be extremely clear from all this stalling that Iran is not adhering to the deal. Inspections will have worked.” He goes on, “Repeatedly delaying inspectors up to the highest possible limit would effectively prove that Iran was cheating, without the world even having to catch them red-handed.” Furthermore, the U.S. does not have to wait 24 days, tools are built into the process to stop Iran and reinstate sanctions unilaterally at any point in the process. The Associated Press reported on Wednesday that Iran would be allowed to self-inspect. That is mostly false. This was an unconfirmed report of a copy of a draft agreement the International Atomic Energy Agency (IAEA) had drawn up with Iran pertaining to one military facility known as Parchin. Max Fisher, again, of vox.xom offers an excellent analysis of this on August 20 and posted a follow-up piece the next day. If there is reason to be concerned, then absolutely it should be addressed. However, the Parchin site was not, according to Fisher, addressed in the deal negotiated with the U.S. and other world powers; this was an agreement between the IAEA and Iran. In the article, he writes that during the 2003 to 2005 negotiations with Iran and other European countries (the U.S. was not directly involved but the Bush administration vetoed these talks for the same reason as today’s opponents) Iran was offering to cap their centrifuges at 3,000. The deal was never made. When Iran returned to the negotiating table in 2013, they now had 20,000 centrifuges and a stockpile of enriched uranium. A deal ten years ago may have prevented that extensive build-up. Furthermore, the fear that Iran would develop a nuclear weapon within a few years has not occurred. Is this deal perfect? Absolutely not. Nor do I support all of President Obama’s policies and deals, as I’m often accused. I am not a fan of the Trans-Pacific Partnership in its current form. I do not approve of the excessive use of drone strikes in Pakistan and other areas of unrest around the world, nor do I approve of the growing surveillance state in the name of security happening in this country, which began rapidly expanding under the George W. Bush administration. Let me offer some final points. A friend on Facebook recently posted on my feed a quote from the Obama administration that read: “A bad deal is better than no deal.” That is a distortion. The actual quote is: “No deal is better than a bad deal.” What is the difference one may ask? Well, it is a big one. The incorrect quote implies that President Obama, Secretary Kerry, and the other P5+1 negotiators are so desperate for a deal that they would push a bad one onto the world, risking the security of not only the negotiating countries’ interests but those in the Middle East and the larger world just so that they can say they had a nuclear deal with Iran. The actual quote stated means that if the Administration had felt the deal failed to meet certain standards, then there would be no deal. The fact that there is a deal means that the parties involved believe it is sound and is the best they could achieve. Could they have done better? Perhaps, some seem to think so. However, President Obama would not be lobbying congressional and senate Democrats if he did not believe this deal was in the best interest of the United States and that it was a solid one. On this, I agree with my president. Those proposing that we should never negotiate with Iran or trust them because some of their leaders are shouting, “Death to America!” is short-sighted. Many Iranians, even some in the top levels of government, see this deal as a chance to escape the crippling sanctions they’ve endured for decades. Iranian citizens do not necessarily hold the same views against the West as the Ayatollah and the hardliners in their government. We Americans certainly don’t agree with our leaders most of the time, why would we believe all Iranians think the same way as their leaders? Many Iranians want their country to be able to participate in the global economy; they are tired of being isolated. Many are hopeful that this deal will improve their economic lot and thus the quality of their every-day lives for themselves and their families. Of course, they want this. Military force and re-instituting sanctions are all options should Iran cheat. Military force should always be the last option because it costs dearly in lives and treasure. This deal must be given a chance and lest we forget, and many have or don’t even know U.S. history with Iran, the United States (the CIA) helped the United Kingdom overthrow a democratically elected prime minister, Mohammad Mossadegh, in 1953 and installed a dictator. The United States is at least somewhat complicit in the turmoil happening throughout the Middle East today. It’s time to restore some balance, and if possible, to do it through a diplomatic and peaceful process.